Hi guys! Happy Tuesday! I hope you all had a fab holiday weekend and are having a good week so far. My Easter was so dreamy and my week is off to a fab start! Even though 90% of the time I am super girly, there are days when outfits like the one in this post today are necessary. 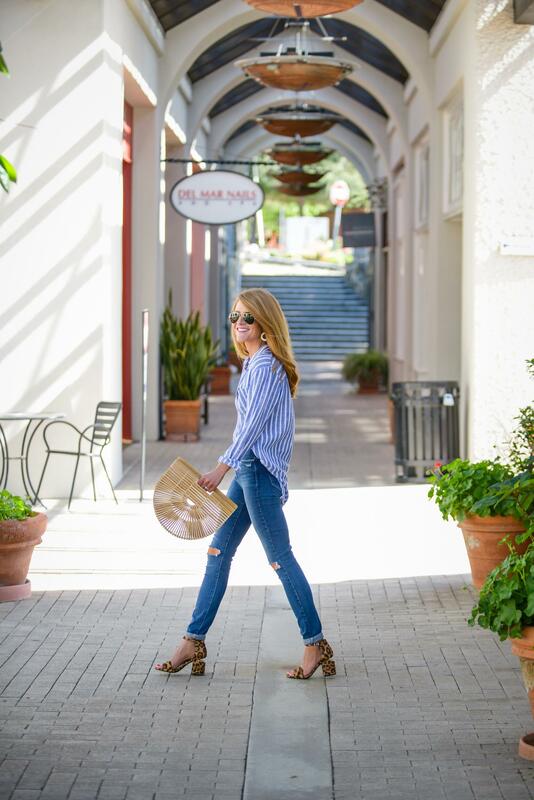 One of my easy go-to’s is always a comfy Rails button down, skinny jeans and then a simple (but still fun) mini heel. This season I am loving stripes, so when I found this blue and white one (from Rails) it’s was an easy must-have. Such a great piece to have for Spring and Summer as it looks so fun with white denim, denim skirts and shorts too. For this look I paired it with this denim from Paige. Perfectly distressed, super skinny, fabulously high waisted and a nice dark wash all add up to make these my all time faves. Because I refuse to let a look go too simple, I went with these insanely fun leopard heels from Alexander Wang. You guys! How fab are these? The cutout block heel is next level and they are super comfy. I love a heel like this for running around! For bag, I wanted something kinda preppy to play off the shirt, so I went with this wooden one from Cult Gaia. How cool is this thing? It is such a statement piece and it looks so fab with Spring + Summery dresses too. I added on my skinny Gucci belt for some sass and went with old school aviator Ray-bans for a classic finish. Hope you guys have a great day today! I am busying around as tomorrow I am off on an exciting adventure! Eep! More details to come later this week! Hi guys! Happy Wednesday! It’s been a fabulous week so far and I am so excited that it’s already the middle of the week! The weather has been amazing here and I am just feeling so grateful for so much lately. I don’t know if it’s Spring that has me all heart eyed over life, but something is in the air! Today is all about basics and how I like to elevate them. I am definitely not a simple jeans and tee sort of girl, but I do love to go casual every now and then. My version of dressing down is taking a couple of standard pieces and adding some bits of flare to kick the look up a notch. This outfit today epitomizes this way of dressing. This super plain, but totally fun Liv poplin top caught my eye on Shopbop with it’s ruffled detailing on the neckline and sleeves. So full of life, right? The bodice is totally oversized making it super comfy and easy. I paired it with these essential jeans from AGoldE (wear them alllll the time!!). If I had to rank my denim, these would definitely be in my top 5 as the fit is so great. A higher waist and a cropped leg, two aspects that I love! The shorter length makes them great to wear with a fun high heel or just as fab with a sneaker for running around. To elevate this look, I went with these super fab tie ankle heels from Alexandre Birman. I love how sassy these are!! They are really comfy and the leather is super plush. I found a couple of good lower priced options that I linked below. Just for a little more personality, I added on this star adorned (how fun?!) belt from Saint Laurent. I am obsessed with this western inspired accessory and honestly find myself wearing it all the time. I love that’s skinny and I am so into silver hardware lately. No look would be complete without a fab bag and because it’s Spring, I went with this studded Saint Laurent. You guys, this bag!!! It’s insanely fabulous, right? I love the size, I love the studs and I am all about the white. So fresh for Spring! (it’s sold out, but available in plain white here and here) I linked some other white bags I am loving below. To finish off this look, I grabbed these girly sunnies from Freda Banana. The pearls match my bag perfectly and just add the right amount of fun! Just by adding a fun heel, a unexpected belt and fresh bag, I took this look from being plain jane to being sassy sara! I am not saying that it’s not ok to wear simple options, I just think it’s great to add on a few touches that make the look a little less drab and alot more fab! Have a great day, friends! I am off to my annual womanly doctors appointment (never fun, but you have to do it, right?) and then am having dinner with a bestie tonight. Hope you all enjoy yours!! HI guys! Happy Thursday! So close to the weekend and soo excited about it. A quick post today as I am headed down to San Diego to do some pics this afternoon, but I wanted to share this fabulous Self Portrait dress as well as a round up of all the dresses I am loving this season. I LOVE a good party and I also LOVE to dress up, so I thought it would be fun to share my fave options. Whether it a be a simple get together with friends, Easter, an engagement party, a charity event, a wedding or a fancy date night, any of these would be fun choices. Wishing you all a happy day and happy weekend! I am so excited to catch up on some sleep and chill out with my boys this weekend. Hope you guys enjoy yours!